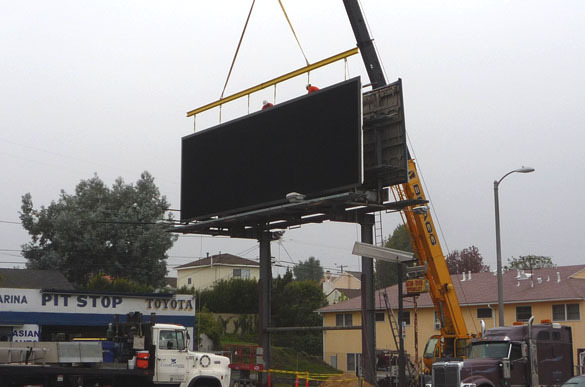 » Legal Wars: End of the Line for L.A.’s Digital Billboards? Legal Wars: End of the Line for L.A.’s Digital Billboards? The final death knell for the 101 digital billboards now flashing their brilliantly-lighted ads on city streets may have been sounded yesterday, when the California Supreme Court refused to review a lower court ruling that says the permits issued for the signs must be revoked. The five-year legal battle over the billboards owned by Clear Channel and CBS Outdoor isn’t quite over, though. An actual order to revoke the permits must be issued by the L.A. County Superior Court judge who ruled in 2009 that a lawsuit settlement agreement between the two companies and the city violated city zoning laws. That agreement allowed each company to convert 420 of their conventional billboards to digital without any public notification or hearings, as well as exempting the signs from various code provisions. Late last year the California Appeals Court upheld the superior court ruling, but went further by directing the judge to order the revocation of the 105 digital billboard permits issued prior to a digital billboard moratorium approved by the City Council late in 2008 and made permanent the next year. Even before the Appeals Court ruling, Clear Channel had been waging an intense lobbying campaign aimed at getting the city to legalize the billboards in exchange for an unspecified amount of revenue from the highly lucrative signs. That campaign heated up last week when the company sent a letter to city officials threatening to sue for well over $100 million in damages if the city revoked the permits. Whether Clear Channel will follow through on such a threat remains to be seen. One city councilmember responded with an obscenity when asked about it, and a private attorney well-versed in signage law told us that he saw no possibility that the city could be held liable for damages by following an order of the court. The letter was sent by Sara Lee Keller, Clear Channel’s General Counsel. After threatening to sue the city for damages “substantially in excess of $100 million” if it interferes in any way with the company’s 84 digital signs (the 17 others belong to CBS), Keller urged the city to engage in formal dispute resolution and adopt a “long-term legislative solution.” According to Keller, that “solution” could include takedowns of existing conventional billboards, the setting of standards for digital sign lighting in residential neighborhoods, and “a process for the City to achieve additional community benefits.” Click here to read full text of letter. Keller also contended that even if the city is ordered to revoke the permits, the digital conversions are valid under other sections of the building code as well as having been given “vested rights” by the digital billboard moratorium and later ban. Yesterday, City Attorney Carmen Trutanich sent a letter of response to Keller, essentially rejecting all of those claims. Click here to read letter. Note: The letter was sent prior to the Supreme Court ruling. Keller’s letter, addressed to Trutanich, Mayor Antonio Villaraigosa, and City Council President Herb Wesson, Jr., was sent on the eve of the first meeting of a “Billboard and Visual Landscape Visioning Group” consisting of billboard company representatives, lobbyists, community activists, and heads of non-profit organizations. The city council’s Planning and Land Use Management (PLUM) committee had voted last month to set up such a group to make recommendations regarding digital billboard regulation. The letter was one of a flurry sent the same day to various city officials. Two, addressed to Michael LoGrande, director of city planning, were sent by Lucinda Starrett, a Clear Channel lobbyist and attorney with Latham & Watkins, one of the city’s most influential law firms. In the first, Starrett repeated most of Keller’s claims and threats, but also proposed specific actions affecting the company’s digital billboards. One proposal would relocate a digital billboard at 10333 Santa Monica Blvd. that has been the target of numerous complaints from an adjacent residential neighborhood, as well as the subject of a current lawsuit. Disclosure: The Coalition to Ban Billboard Blight is one of the parties in that lawsuit. According to Starrett’s letter, Clear Channel is willing to convert the billboard back to a conventional static sign and relocate the digital face to a billboard in Council District 7 in the San Fernando Valley. In addition, the city would “confirm the legality” of an existing digital billboard at 721 N. La Brea Ave., the site of the iconic Pink’s Hot Dogs. In return, the city would get space on the billboards for public interest and emergency messages as well as other unspecified community benefits. Starrett is a member of the billboard visioning group, which was to meet three times in two weeks and then make a report to the PLUM committee. Also members are lobbyists and representatives of billboard companies CBS Outdoor, Lamar Advertising, Van Wagner, Regency Outdoor, and Summit Media, the small sign company that brought the lawsuit culminating in yesterday’s California Supreme Court ruling. All of those companies except Summit Media have publicly stated their desire to have digital billboards. The final meeting of the group will be held Thursday, March 7, from 9 to 11 a.m. in Room 525 of City Hall. The meetings are open to the public. Click here for group description and list of members. The PLUM committee’s directive to set up the group came along with approval of a new city-wide sign ordinance that has been in the works for more than four years. That ordinance expected to be in final legal form and ready for full City Council action within a few weeeks prohibits digital billboards everywhere but in special sign districts. The current ordinance also includes that prohibition, but the new ordinance is much more restrictive regarding where sign districts can be established, and what findings must be made before a district can be approved. A number of community members of the visioning group have argued against any measure that would allow digital billboards outside these districts where they can be strictly regulated as to size, brightness, orientation, and proximity to residential properties. On the other side, sign industry and business representatives have said the city should allow them where community and City Council members are not opposed and where they can generate revenue or other public benefits. For media reports on Clear Channel’s $100 million threat, see below.